What Day Of The Week Is May 1? 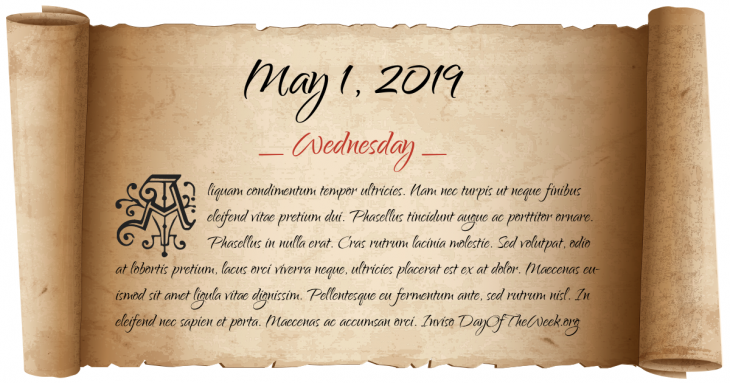 May 1, 2019 is the 121st day of the year 2019 in the Gregorian calendar. There are 244 days remaining until the end of the year. The day of the week is Wednesday. The Nea Ekklesia is inaugurated in Constantinople, setting the model for all later cross-in-square Orthodox churches. The Penny Black, the first official adhesive postage stamp, is issued in the United Kingdom. The first cooked meals on a scheduled flight are introduced on an Imperial Airways flight from London to Paris. The Roca-Runciman Treaty between Argentina and Great Britain is signed by Julio Argentino Roca, Jr., and Sir Walter Runciman. Who were born on May 1?